Music is a core part of many events ranging from weddings to charities. Ideally, music at an event should make the event enjoyable. ​ This, however, depends on who is actually playing the music or choosing the playlist. This is why it is always wise to hire an experienced and reputable DJ. This is the reason our DJ services in Calgary and surrounding towns comes second to none. We have hosted in hundreds of diverse events over the years and have a long list of satisfied clients. Read on to learn what makes us one of the best in the industry. Our disc jockey is one of the best in Calgary and its environs. He offers services for a wide range of events ranging from the formal to the informal: He can be a dj for weddings, anniversaries, corporate events, and so much more. ​He has a deep understanding of music and knows which songs to play for which event – he has the perfect selection for whatever theme of event you may have in mind. In addition to DJ services, he also doubles up as a master of ceremony for all types of events. He has excellent communication skills that he uses to keep the audience engaged and entertained. He will work with you to learn everything there is to know about your event and pass the right message. He will even dress up for the event and match his words with just the right physical language to ensure that the event is an overall success. 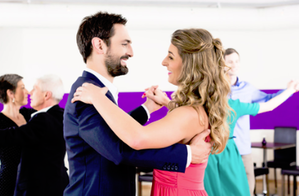 Our Deejay has a wide range of offers and promotions for his clients, and the most popular item on the list is a free dancing lesson. That’s right, every client who books a gig gets a free dancing lesson at his/her convenience you get to choose the place and time. Please let us know your event date and anymore information with requirements thanks! 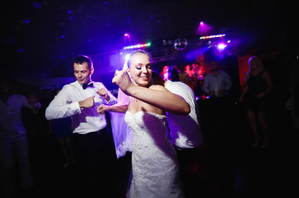 · Why our Calgary Wedding DJ? DJ Eddie has been in business for years. He started off as a novice playing with deejay equipment at a young age and has since worked up the ranks to become a professional, popular DJ. His vast experience makes him better not only at music selection but also blending in with guests and hosting events of all kinds. To this end, he brings everything he has learnt from the hundreds of previous events that he has catered for to your event ranging from private parties to weddings. Eddie is more than just a DJ – he also offers complementary products and services. He has a passion for music in general and will provide you with everything you need to have for an unforgettable experience. He also serves as a host or master of ceremony for all sorts of events ranging from wild private parties to weddings and even can be a DJ for corporate events. He has good communication skills and will ensure that everybody at the event stays entertained and informed. He matches his words with the proper tone and physical language to bring out the desired effect, thus ensuring that the event is successful for its hosts. He has next-generation music equipment built for power and clarity. His wide range of speakers and complementary products is sufficient to cater for events of all sizes and ensure that the music reaches everyone. His lighting equipment also adds to the hype of any event and will transform any venue into a dance floor. What’s more, he will stay on to offer maintenance services if necessary. He is especially popular with live bands from out of town but will cater to everyone in need of his services. DJ's are naturally likeable and he is not an exception. He has a friendly personality that resonates with everyone around him. In fact, his personality is half the reason why he is so popular both with clients in and beyond Calgary on a professional as well as personal level. To this end, DJ Eddie is the perfect fit for any music gig not only for his mad mix and dance skills but also because he will help contribute to the fun. This especially comes in handy when you need the services of a good master of ceremony as he is able to easily get guests’ attention and sway their minds. You shouldn’t have to break the bank to enjoy decent DJ services. You don’t have to worry about this when working with our DJ as his services are affordable. He has reasonable price tags for all sorts of events and his services are scalable. Besides, you are guaranteed value for every penny as you will be working with one of the best in town. ​Eddie offers more than just a free lesson promotion. He has gift cards as well as bonuses which you can get on future bookings for referring your friends to DJ Eddie. In addition to promotions, he also offers his clients free online tools to help them plan their events. These include playlists to help you select songs that you would like our wedding DJ to play for you. Lovebirds also get planning forms to help them organize their weddings for flawless experiences. ​DJ Eddie has been recognized severally for his expertise. He has a 5-star rating on Google thanks to his popularity. What’s more, his popularity often sees him operating well beyond Calgary. These places include High River, Okotoks, Strathmore, Airdrie, Banff, Canmore, Olds, Waterton Park, Red Deer, Lethbridge, Lake Louise, Crowsnest Pass, and Pincher Creek. He is also open to special requests all over the U.S.
​So, are you convinced yet? If not, then perhaps you would like to learn more about our services. We are always happy to serve new customers and would be glad to help. As such, you can contact DJ Eddie on our website and ask for any clarification. He will address all your concerns immediately and even fill you in on more details. You can also fill out our free quote form to book our services. Remember, get in touch several days or weeks before the day of the event to give us enough time to prepare properly for your upcoming event. However, we also offer emergency services so don’t be shy to get in touch and tell us what you need – you have great offers and promotions to look forward to.